All transactions are safe and secure with a reliable history in online purchasing behind each of our associates. 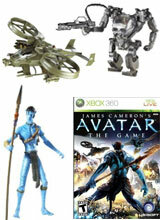 Buy the Avatar Action Figures and Video Games to own Avatar clothing and merchandise. Relive all of your favorite movie moments that unfolded on the planet Pandora with these Avatar action figures, toys and video games. Collect Na'vi figures including Neytiri and the Leonopteryx flying creature on which she can ride. Do battle with Colonel Miles Quaritch in his Amp Suit or take to the skies in an RDA Scorpion Gunship toy. If you like playing with controllers more than figures, pick up the Avatar video game that lets you play on either the side of the RDA or the Na'vi. In addition to the Avatar Action Figures and Video Games above, browse the Avatar Clothing Gallery for more apparel like men's and women's clothes, kids shirts or hoodies.